Today’s Veterinary Business provides information and resources designed to help veterinarians and office management improve the financial performance of their practices, allowing them to increase the level of patient care and client service. 45 December 2017/January 2018 • TODAYSVETERINARYBUSINESS.COM Other steps include: • Call the client a day or two be- fore the scheduled procedure to confirm the appointment. Give preoperative instructions such as feeding requirements and drop-off time. • Make sure the chart and any needed forms are ready when the client and patient arrive. Efficiency is key. • The technician or someone from the surgery team should greet the client, admit the pet to the hospital and address any questions or concerns. • Obtain clients' current contact information. • Schedule a discharge appoint- ment before the client leaves. During How we prepare for a surgical procedure is an important step. A great surgeon once told me: "The client will never see what went on beneath the incision, so they will judge us by how their pet looks afterwards. If all they see is a puck- ered and bloody incision, an uneven shave or a wrinkled bandage or cast, they will assume we were just as careless in the surgical procedure." We may not have total con- trol over how the incision comes together, but we do have control over the rest. Be precise with the clippers, even for procedures as routine as a spay or neuter. This in- cludes the shave for the IV catheter, pain-control patches and monitor- ing devices. Take the time necessary to make sure that what the client sees is your best effort. The client will have to look at the surgery site for weeks as the hair grows back. Also remember: • Make sure all shaves are straight, symmetrical and not excessive. • Maintain clippers and blades to avoid clipper burn, scrapes or cuts. • Follow your hospital's patient care models with respect to anesthetic induc- tion and monitoring. • Use a patient warming device during the procedure. • If complications arise or addi- tional services are necessary, update the client immediately and ask for authorization of any additional charges. • Once surgery is complete and before the patient is awake, clean the incision and surrounding area. Remem- ber to check for bloody tongues, lips and whiskers on a dental patient. • Provide pain control as need- ed. Patient comfort should be a priority. • Give a complimentary nail trim and list it on the invoice as such. • Contact the client to report how the procedure went and how the pet is doing. • If a discharge appointment was not set up, now is the time to do it. • Keep the patient warm, comfortable and under observation throughout the recovery process. Afterward Now that the procedure is complete and the patient is recovering from anesthesia, make sure everything is as it should be. 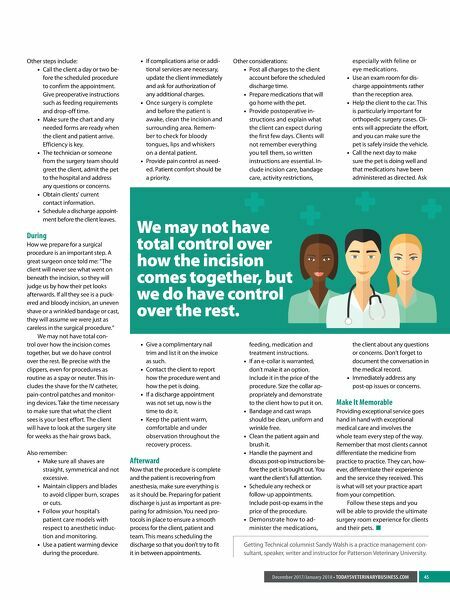 Preparing for patient discharge is just as important as pre- paring for admission. You need pro- tocols in place to ensure a smooth process for the client, patient and team. This means scheduling the discharge so that you don't try to fit it in between appointments. Other considerations: • Post all charges to the client account before the scheduled discharge time. • Prepare medications that will go home with the pet. • Provide postoperative in- structions and explain what the client can expect during the first few days. Clients will not remember everything you tell them, so written instructions are essential. In- clude incision care, bandage care, activity restrictions, feeding, medication and treatment instructions. • If an e-collar is warranted, don't make it an option. Include it in the price of the procedure. Size the collar ap- propriately and demonstrate to the client how to put it on. • Bandage and cast wraps should be clean, uniform and wrinkle free. • Clean the patient again and brush it. • Handle the payment and discuss post-op instructions be- fore the pet is brought out. You want the client's full attention. • Schedule any recheck or follow-up appointments. Include post-op exams in the price of the procedure. • Demonstrate how to ad- minister the medications, especially with feline or eye medications. • Use an exam room for dis- charge appointments rather than the reception area. • Help the client to the car. This is particularly important for orthopedic surgery cases. Cli- ents will appreciate the effort, and you can make sure the pet is safely inside the vehicle. • Call the next day to make sure the pet is doing well and that medications have been administered as directed. Ask the client about any questions or concerns. Don't forget to document the conversation in the medical record. • Immediately address any post-op issues or concerns. Make It Memorable Providing exceptional service goes hand in hand with exceptional medical care and involves the whole team every step of the way. Remember that most clients cannot differentiate the medicine from practice to practice. They can, how- ever, differentiate their experience and the service they received. This is what will set your practice apart from your competition. 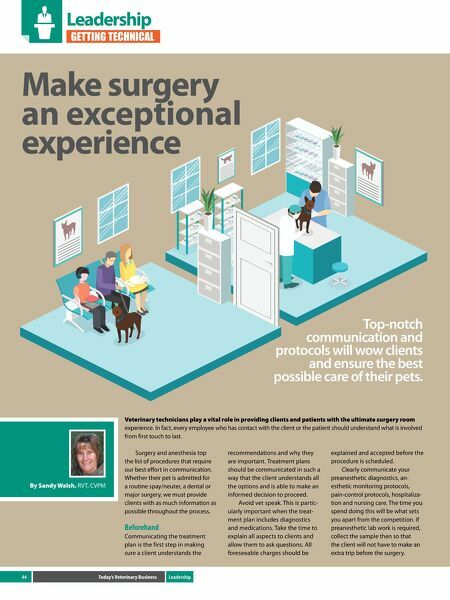 Follow these steps and you will be able to provide the ultimate surgery room experience for clients and their pets. Getting Technical columnist Sandy Walsh is a practice management con- sultant, speaker, writer and instructor for Patterson Veterinary University. We may not have total control over how the incision comes together, but we do have control over the rest.